I stopped reading Thought Catalog a while ago, mainly because there was an attempt at “satire” or something on there that was highly distasteful and offensive. I can’t even remember what it was about, to be honest. However, today I saw an article entitled,“Read This If You’re Worried That You’ll Never Find ‘The One'”. Actually, I’d seen it a few times and ignored it, but decided to go ahead and click it. And I’m very happy that I did. I encourage you to go read it in it’s entirety, but there are two parts that I wanted to highlight. My story —> There was a time when I was strictly family oriented. Career? Blah. I mean, as long as I had gainful employment then so what, right? This was honestly my thought process, even after finishing my first master’s degree and starting my first job out of graduate school. At that point, I was in a relationship and I was SOOOOOO happy. I mean, that is where my focus was. And it seemed to be heading in a direction that I wanted, a family. So all was well. It was then when I was forced to face other areas of my life and it was then that I discovered that I HATED my job. And that is when I started making moves in my career. That’s when I got focused on what I really wanted to do. What would make me happy in that area. I’m not saying that the desire to have a family is completely gone, but what I AM saying is that I was forced to look to other areas for “happiness” and fulfillment when I no longer had the joy of my relationship. What’s funny is that my best friend and I had this conversation last year (I think). We were talking about me and my lack of a serious relationship at the time. She told me that she thought that God kept me single for that season because if I was in a relationship she seriously doubted I would be making the moves that I was at that moment. At that point, I was heading toward finishing my second master’s degree (in my desired field!!) and was contemplating applying for a doctoral program (I did. And got accepted.). I immediately agreed with her. For me, I HIGHLY doubt I would’ve wanted to take the time/money away from my family that I had to invest into that master’s degree while working full time. But still, after reading this article, I reflected and found out that there are still things that I hold back on (at times) in hopes of a relationship. I think it’s normal to feel some sort of way about the thought of not ever finding someone, but, it does us single folk a disservice to harp on that. What’s the point? If it’s not gonna happen, we may as well ride this whole life thing until the wheels fall off, right? So yeah. It’ll take more reflecting from me, and A LOT of cognitive restructuring, but this is a promise I’m making to myself. Live my life for and with myself and the ones who I love and who love me that are in it right now. This sounds much better than trying to “prepare” my life for something that just may not happen. As you remember from my first post about being accepted into my PhD program, it was something that was an amazing and exciting next step in my academic and professional journey. I ordered my books about a month ago. I got them and….left them in the box. This is when things kind of got strange for me. Because that’s not like me (as my friend pointed out when I called and told her my final decision). I had chapters to read! A paper to write! I’ve always, at the very least, opened my books to look through them. Not this time. It was about to come together for me. About two or three weeks ago, I got an email from the supervisor from one of my classes. One class we have to take is a practicum, which means we’d be working in a clinic (I was excited about this). What it also means is that we have to be supervised (which is necessary) and it had to be with someone within the program, and outside of class time. The email was her introducing herself, letting us know that she is aware we work full time, and that she doesn’t work in the evenings. So I went back and fourth with her. Her telling me about being flexible, and me informing her that I don’t need flexibility and sacrifice explained to me, as I am NO stranger to it, as indicated by my successful academic track record. I was honest with her and told her that I was frustrated because one line she’s telling me she knows we work full time, and then the next line she’s saying she doesn’t work in the evenings. She suggested to me, more than once, that I leave work in the middle of the day to meet with her. And again, I told her that I just can’t up and go missing from my job for almost 3 hours in the middle of the day (45 minute drive there and back, and meet with her for 45 minutes). After explaining that, she opened an evening time. It would mean me going up to the campus another evening, but whatever. Sacrifice, right? So that was worked out. Last week I got a phone call from the professor of that same class. He wanted to know if I could come in the middle of the day to run a group session, which is a requirement for the class. In orientation, we were told that the group session would be apart of our clinic time (4:30 – 9:50!!!!!!!). But now he was telling me that he DIDN’T want it during clinic time, and that I needed to get it done outside of class time. To be fair, he was very nice about it. He tried to work with me. He asked if I could run a group at my job (I did my internship here for my master’s program). I can’t. Summer is our busy season and when I am at work, I’m going to be expected to be in my office, doing my job. But. We came up with a plan. At the end of it all, I wrote out what my weeks, for ten weeks, would look like with the changes. All of this with my days starting out around 5:30am. I looked at this and wondered…..HOW. When am I gonna study? When am I gonna read? When am I gonna live? HOW AM I NOT GONNA DIE!? By the way, my job has been SUPER flexible. They let me work out my hours so that I could get to class on time (in the summer, we work until 5:30pm). Leaving two hours earlier one day, even earlier that that the next day…and letting me make up the hours on the weekend (we don’t work on Fridays during the summer). My job has been MORE than accommodating. Later, I spoke with my close friend and my former clinical supervisor. They both gasped. My friend was like, “WHYYYYY?” LOL. They knew how excited I was, and what I went through to get into this program. But then I explained the latest developments with them and laid out my schedule. They both agreed with me. My supervisor has gone through a doctoral program and even he said that was a tough schedule to keep up with week after week, and be present at work. He said that whenever I started, I wanted to have a GOOD first semester, and not set myself up for failure. My mind is made up, and my decision is that I am not going to start the doctoral program this upcoming summer semester. I explained all of this to the director of the program. I asked him about options. Can I do a fall start (the program always starts in the summer)? Can I substitute the practicum for another class (it is a cohort model so all of our classes are already laid out)? He told me no to both of those. There have been some moves that I’ve wanted to make at my job…and have procrastinated doing so. If everything works out, my current situation will not be the same situation by summer of 2016. More on that later, but in (and through) it all, I trust God, and believe in myself, to get it done. I’m at peace with my decision. I didn’t even cry (which is HUGE)!!! I don’t want to have more stress than necessary. I don’t want to burn out. And I want to go into the program with enough time to properly dedicate to it and with a certain amount of experience. I have been admitted into the Counselor Education, PhD program, to start Summer 2016. Late night Wednesday, April 29th/early morning Thursday, April 30th, I was awake. Worrying. There was a certain area in my life that was lacking and I did not know what in the world I was going to do about it. Time was running out. Decisions needed to be made. I felt helpless….hopeless. Suffocated. I was frustrated…angry even. Telling God that He KNOWS I am doing all that I can…so why? At some point, I just resolved that “it is what it is” and tried to calm myself down. Cause no real solutions come to you when you’re frustrated, upset, and emotional, right? DO YOU SEE THAT FIRST SENTENCE!? 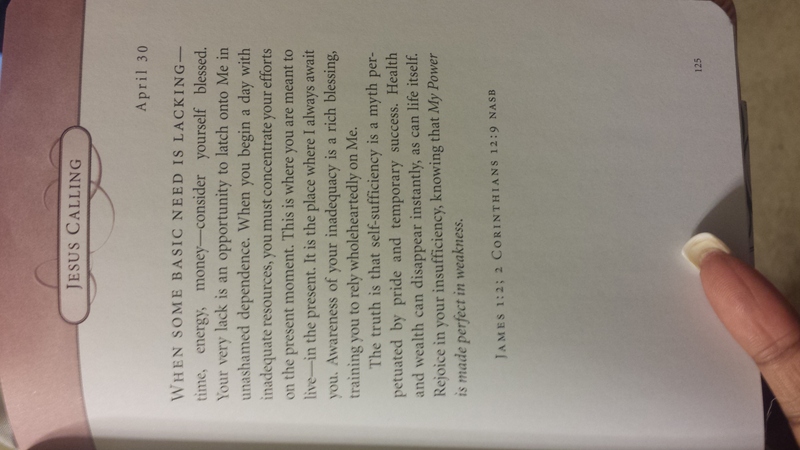 I mean, I was in shock at the timing, accuracy, and message of this devotion. The very morning after I had stayed awake worrying about this very thing? Also, on Monday (April 27th) I started fasting and praying about this area in my life. At first I said I would do it for a week, but then by Thursday, I resolved to continue my fast until I got some answers and/or clear direction. Back to Thursday, April 30th. I got my answer. It was done. Problem solved. Just like that. My prayers were answered, immediate problems solved, and let me tell you something, God gave me DOUBLE (triple??) FOR MY TROUBLE! He showed up and showed OUT. I cried. I’ve continued to cry. Every single time I think about it, I cry. I’ve had to contain myself when I’m in public cause I really could break out into a shout at any given moment (so if you know me personally, don’t be shocked if I suddenly start crying all over the place. I’m serious). And watch this. —> I was blessed because others around me were blessed. I had been praying for a blessing for some specific people in my life and God came through and man LOOK. Speechless. I did not have the words. I DO not have the words. My heart is so full. There ARE no words to tell the Lord how much I love Him and how much I thank Him. If I had 10,000 tongues…. BEEN worrying about this for forever. Started fasting and praying Monday. Up in the middle of the night Wednesday. 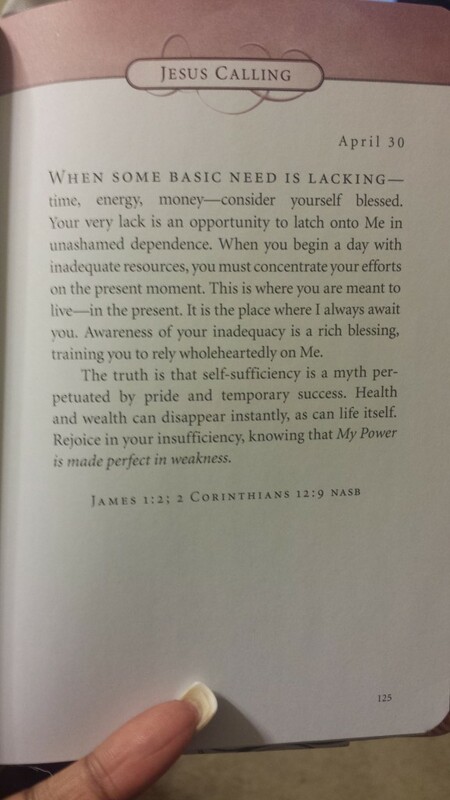 Devotional telling me to focus on the present and depend on God Thursday morning. Thursday at 4:05pm, PRAYER ANSWERED. The ENTIRE point of this post is twofold. 1. To give God ALL OF THE GLORY and tell about how good He is in the most public way I know how, and the most public medium I have. 2. To encourage *you* to JUST HOLD ON. His timing is PERFECT. He knows what we need and when we need it. When your back is against the wall, and you are your most hopeless and helpless, DON’T FORGET ABOUT WHOSE CHILD YOU ARE. Do whatever you need to do in order to refocus on God and not on your problem. The harder it gets, the harder you pray. And how about you go ahead and praise Him, too? I can’t be 100% sure about most things, but I can tell you all, with 100% certainty, that WHEREVER it is that you are lacking, God WILL fill that place in a SUPERNATURAL way so that you can ONLY say it was Him! Trust Him! Lean on Him! He WILL come through! Throughout the past months, there has been a song that, whenever it came on, it encouraged me soooo much and snapped me out of my (CONSTANT) state of worry and got me into an immediate posture of praise. This song was done FOR me. I’m convinced of it! I’m going to share it with you, and I really hope it blesses you as it has done for me. Cause I’ve seen him do it before!